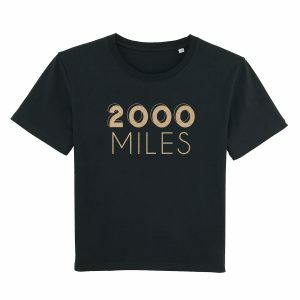 2000 MILES T-SHIRT This boyfriend style t-shirt was originally designed for Christmas, 2ooo miles being one of my all time favourite Christmas songs. A tiny step away from wine, but a lot of thought went into these words. Starting from a personal point, and transitioning into something completely different. This t-shirt supports the brave and totally inspiring adventure of Katy Macmillan-Scott. I've written my first blog piece about this which you can read HERE. Her story completely blew me away and I immediately knew I wanted to help. Aside from this, it's a really cool tee and I'm embracing my inner rock chick. £5 from the sale of each T-shirt goes to Bowel Cancer UK. The Bon Spice T-shirt is a classic round neck jersey tee. This soft black t-shirt with it's flash of gold looks great popping out from under a jacket. Team with boyfriend jeans and a heel for a bit of casual glamour, or trainers and a skirt for a more edgy look. The Bon Vintage slogan Tshirt is a classic easy to wear design. With a deep round slightly V neck, raw edged collar and rolled up sleeve, this tee is perfect for hanging loose over skinny pants or tucked into a skirt or high waisted jeans for a cool edgy look. Soft, comfortable and really easy to wear. A great addition to any wardrobe. As seen on fashion bloggers Kat of Doesmybumlook40 fame, Abi of Stealmystyle40 and Helen of 40plusnotgivingupyet. BON VINTAGE - Because everyone's birth year is a good year. 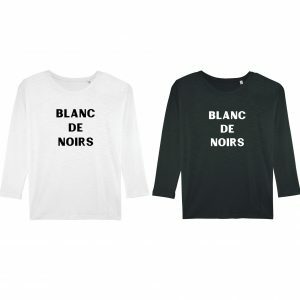 The SANTÉ slogan Tshirt is another classic easy-to-wear design. This slub tshirt is fine cotton, has a deep raw edge V neck and raw edge sleeve and hem. The style hangs perfectly over trousers due to the hem being slightly gathered, or can be tucked into a skirt or high waisted jeans for a cool edgy look. It's a truly stylish cotton TShirt. Soft, comfortable and really easy to wear. Another great addition to any wardrobe. Looks amazing with jeans, and a suit jacket Note, the edges are meant to be raw and unfinished, there will be some slight shedding of fibres which will disappear. The ROSÉ Tshirt is back! A classic easy to wear design. This popular Rosé t-shirt has a deep round neck, raw edged collar and rolled up sleeve. It's perfect for hanging loose over skinny pants or tucked into a skirt or high waisted jeans for a cool edgy look. Soft, comfortable and really easy to wear. A great addition to any wardrobe. Now comes in Anthracite with super pale pink or Anthracite with dusty dark pink retro. Both are super stylish and classic. As seen on fashion blogger Kat of Doesmybumlook40 fame and Instagram sensation The Fashionable Pan. Celebrating one of our favourite wines of the summer. Also available as a handmade Moroccan cushion! Please visit Anna Cox Cushions to purchase these beautiful artisan cushions. PLEASE NOTE: New delivery arrives Friday 26th April. You can pre-order for dispatch Monday 29th April. More RETRO arriving 17th May if size is out. A harvesting method used in vineyards. One reason being to avoid damaging grapes with very delicate skins I love the casualness of this t-shirt. It's a medium fit, straight with a nice length sleeve. Round necked classic jersey t-shirt made from organic cotton that washes really well. See how we're styling it with skirts and trousers. Easy to dress up or down and looks great under a blazer. See how amazing @fashionablepan looks in it on Instagram. ©2019 FWPBY all rights reserved.